In the spring of 2005, Teinert Metals, Inc. opened its doors in Lubbock, Texas as a small steel warehouse with big goals. The company saw a need for a steel warehouse in West Texas dedicated to reliable efficiency, exceptional quality and remarkable service, delivered by friendly people. 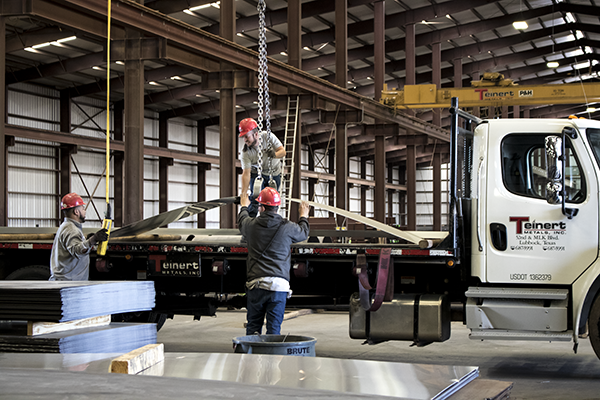 With every employee devoted to those founding principles, Teinert Metals has grown into a premier steel and metal warehouse committed to serving all customers, industries, and needs throughout the region. In 2007, Teinert Metals completed its first office and warehouse complex in southeast Lubbock at the intersection of 52nd Street and Martin Luther King, Jr. Blvd. The first warehouse featured approximately 60,000 sq. ft. to house the metal and steel products sold to the company's growing customer base. Teinert Metals kicked off 2010 by completing its first expansion, more than doubling its warehouse space to the current 134,000 sq.ft. In 2013, the company saw more growth as a new 55,000 sq. ft. warehouse was constructed immediately north of the main warehouse and office complex. Today, Teinert Metals sits on a total of 20 acres with more than 189,000 sq. ft. of warehouse space between both the main and north warehouse with a total of seven cranes, rail services, free delivery, saw cutting capabilities and an entire staff of over 35 hardworking and dedicated individuals. In order to offer their customer base the highest quality of products in the steel and metal industry, Teinert Metals joined the North American Steel Alliance (NASA) in 2014. Incorporated in 1996, North American Steel Alliance is a member owned purchasing cooperative serving the metals distribution industry. Today, NASA and its 120 independently owned and operated steel service centers collectively represents annual revenues exceeding $9 billion dollars making it one of the top 10 purchasing cooperatives in all of North America, based on total dollars purchased through preferred suppliers. Their primary business focus is to strategically link members with the highest quality preferred suppliers, both metal and operational to share innovative ideas and create unique opportunities increasing profitability and ensuring ongoing success. That principal fits directly with Teinert Metals’ mission and the company is very proud of its membership with the North American Steel Alliance. In 2016, Teinert Metals was also very proud to become a designated Hardox® Wearpart Center. With its unparalleled combination of hardness and toughness, Hardox® wear plate sets the standard worldwide for abrasion-resistant (AR) steel. Thanks to its unique qualities, it can even perform as a load-bearing part in many applications, opening new possibilities for structural design innovation. Hardox® wear plate offers better wear resistance, higher payload and longer service life. There are over 300 Hardox® WearpartCenters across 75 countries worldwide and Teinert Metals is the only Hardox® Wearpart Center in a roughly 500 mile radius, making it the only place customers in the region can find this exceptional product to meet their needs. Teinert Metals, Inc. is a steel and metal warehouse located in Lubbock, Texas dedicated to the principles of reliable efficiency, exceptional quality, remarkable service and friendly people. Teinert Metals, Inc., promises to consistently offer the highest quality of products and friendliest customer service in all of West Texas and Eastern New Mexico. That is the “Teinert” difference!! !